Charged with the awesome responsibility of supporting the world's largest and most technologically advanced fighting force, the Department of Defense was created in 1949, and now overseas all branches of the Armed Forces - America's proud military family. The Department of Defense supports 1.4 million active-duty soldiers, 1.2 million Guard and Reserve personnel, 2 million military retirees and their families, and 654, 000 civilian employees. Headquartered at the Pentagon, it operates from more than 6,000 locations worldwide. This unique coin, with a narrow cut-out section, is dedicated to the military and civilian members of the Department of Defense, who enable that organization to meet its mission to protect and defend Americans at home and abroad. Minted in a brass alloy, this coin contains rich enamel accents on both its obverse and reverse sides. The obverse features the official seal of the Department of Defense. 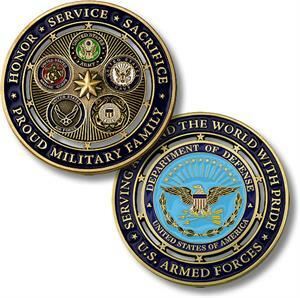 On the coin's obverse are the official seals of the five branches of America's Armed Forces. Each piece comes packaged with a header card that describes the history and mission of the Department of Defense.